You may recall an earlier post (at which you can read details) about the launch of a companion piece to the Midnight Planétarium Poetic Complication, made in collaboration with astronomical watch specialist extraordinaire Christiaan van der Klaauw. 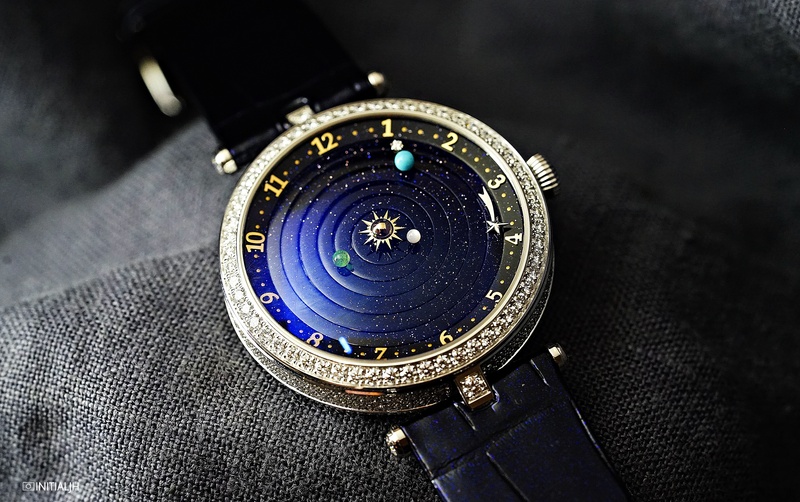 in the form of the Lady Arpels Planétarium timepiece. 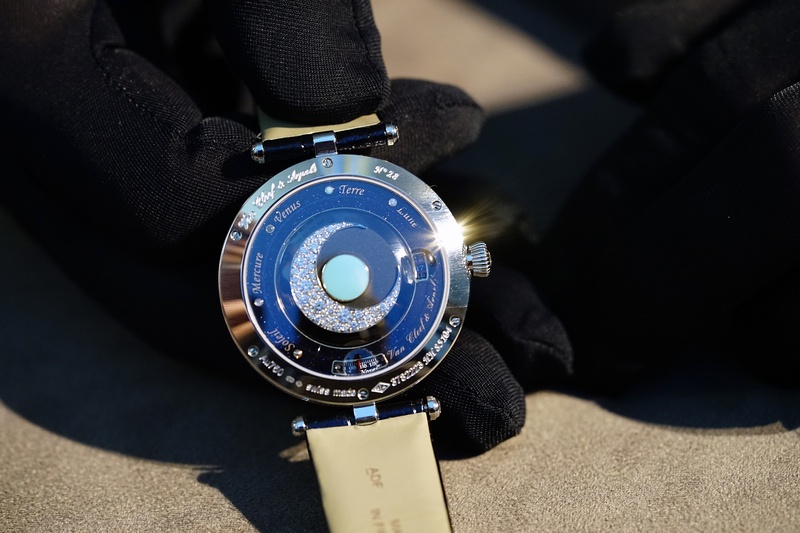 This was one of the watches we had the opportunity to see at the SIHH 2018. The aventurine disc dial, the planets, are all familiar to those who love and admire the original version. It is as you would expect it to be, which in this case, is a very good thing indeed. There is also a ‘poetic secret’. The diamond moon moves around Earth as it should, and what’s more, you can tell whether it’s a full moon or the quarters from the light and shadow between the sun and Earth. All of this comes in a 38mm white gold diamond-set case with diamonds in the bezel in the crown. Each numbered watch is offered in one of two variants, a blue glitter alligator strap with a white gold pin buckle set with diamonds (the one in this post) or white gold bracelet set with diamonds. To handle and put on the wrist, it has not just a design presence but a strong physical presence as well, whilst still sitting comfortably on the wrist. 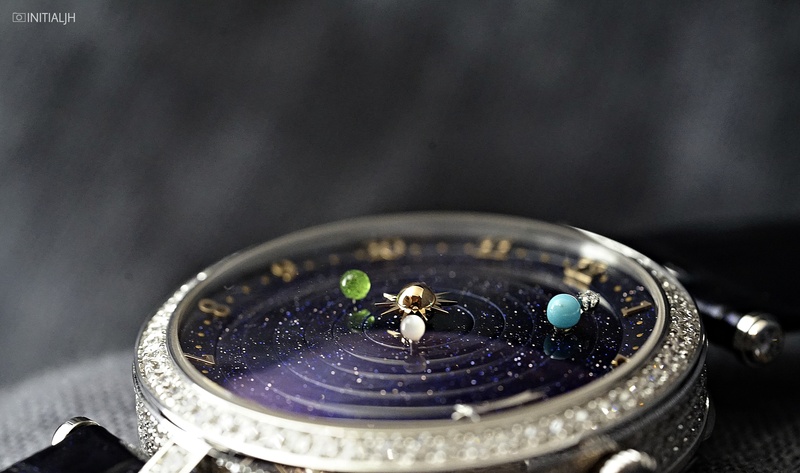 There are women who prefer their watches under 38mm, but a watch such as this simply can’t be any smaller because of the movement, but also because an astronomical theme deserves a dial of at least a certain size so that its full effect may shine. For pricing details contact your nearest Van Cleef & Arpels boutique.